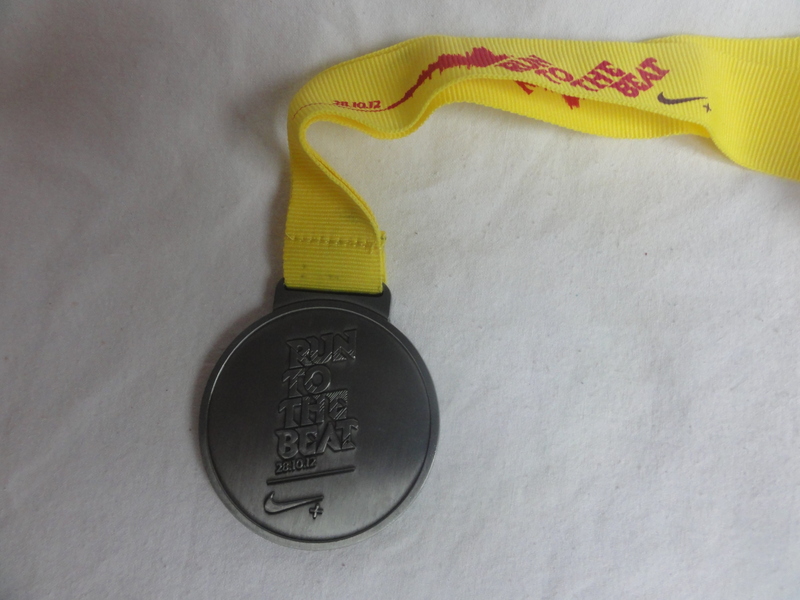 Last Sunday I took part in Run To The Beat, a half marathon held in London. With an expected 18,500 runners this was the largest race that I had ever taken part in but, with the 14 stages around the course, one that I was really looking forward to. The other issue was the weather. In the UK the weather has this habit of luring me into a false sense of security during October when it seems as if I will be able to enjoy the fireworks on Nov.5th without freezing. Then, during the last weekend in October it suddenly turns cold. This year was no exception with the first frost (and even snow in the North) being forecast for the night of the 27th! The trouble with this was that all the training had been done in relatively warm weather and we were, therefore relatively unprepared for cold. What would I wear? We were given these lovely yellow t-shirts with our running number on. These are the proper running tops but were not really made for the cold weather. Therefore the Saturday before saw me rushing into the shops to buy a long sleeved skin to wear underneath. The journey there was quick and easy. We parked right next to the start. So far so good! From there on however it got a bit harder. We had at least an hour to kill and it was COLD. Very, very cold out. Having done the obligatory toilet stop we decided to head for the O2 in a vain attempt to keep warm. It worked a bit and we killed a fair bit of time wandering around. As the start time approached we decided that we should think about getting rid of our bags and head towards the start. As we had parked so close we decided to leave our things in the car to save queuing at the bag drop off. Unfortunately the route to the pens took us through the bag drop off anyway. This was all incredibly slow as the shear amount of people meant congestion at the entrances and exits. In order to get to the timing pens we had a very long, slow walk, followed by a long period of time standing around as we waited for the start. It was during this time that we quite simply froze. Those of us who hadn’t opted for under garments were positively freezing although how they could have been any colder than us with gloves, hats etc I am not entirely sure! As with all races it took us a fair amount of time to cross the start line. There was some confusion as to when the race actually started as there were two lots of cheering, either one of which could have signaled the start. We were later told that the race had started promptly. According to my Garmin we didn’t cross the start line until 10.03. The route was easy to follow with well organised water stations scattered around the course. There were also a couple of Powerade stations. Most of the route was wide enough to cope with the numbers of people – some weaving is inevitable. There was one point where the race came to a complete standstill at a gate and several points with a 360′ turn that also slowed everyone down. During the race there were also a number of sections where you were running with the racers ahead of you running the opposite way. I don’t know about you but I really am not a fan of this. It is a bit demoralizing to see all those ahead of you. I also feel a bit sorry for those behind me. Very naively I believed London to be flat. This race is proof that it is truly not . There were a couple of hills that seemed to go on for quite a long time. I am very proud to say that I didn’t stop and walk but it certainly took it out of me. It would have been great if they could have put one of their stages on these as the music stations really did help to spur me on and would therefore have been very helpful on these hills. On a more positive note, over the last three miles there was a long down hill section which was very welcome indeed. I even overtook a motorbike on this (a slow one obviously but still!) 🙂 I was a bit cautious as to whether there would be an uphill but luckily there wasn’t. As always with me, I started off really well but faded badly at the end! I blame the freezing weather zapping all the energy out of me before I even started. This was a very slow process during which we got very, very cold all over again. I would have preferred to have had a warm blanket rather than cold drinks! Overall I have to say that the organisation at the start and end was not that brilliant, although the race was not that bad. As I write this post I see that there are several photos of medics helping competitors – due to the cold or simply casualties of the race? According to the official timings I ran the race in 2.06 with an average pace of 9.39. I am happy enough with this……. but, the map that shows my pace over the whole race shows miles 6-9 as my slowest. As these are the ones with the hills in this may not be very surprising but personally I would have thought the last three would have been my slowest seeing how I managed to walk most of the last mile! According to my watch I did it 2.01hrs with an average pace of 9.16. I am not sure which is correct to be truthful. My watch did finish before the race officially did but could this be down to the weaving around that I did. How accurate do you believe your Garmins or running APPS to be? I enjoyed running with a lot of people – it really helps to keep you going. I enjoyed the atmosphere of running in a large race. I enjoyed the live music around the course. I did not enjoy the cold at the beginning and end although I do realise that there is not that much you can do about this, particularly the beginning. The beginning and end seemed to be quite chaotic and the end in particular could have been better organised. I would like the chips to be able to be cut off rather than us having to bend down ourselves. Those of you reading this may feel that I am being a bit picky but I would just like to say that overall I did enjoy it and would run it again. Here’s to my next race – a 10k on New Years Eve! Photos taken from the Run To The Beat Website – fancy joining me next year? Sign up for news on the official website.